At first, I was so exited, that this anime is about classical music. I love classical music, so it's obvious. I really didn't expected the disappointment, that awaited me. The story is about a girl Kahoko, who gets from a fairy a magic violin and than participates in a competition. By that time she meets with taleted people form her school, who can play the musical instrument. I have a feeling that this anime says: "As long as you love music (musical instrument), you're playing will be good, people will enjoy it." - I haven't thought so from the beginning, I believed to the end that this anime can't be that absurd. I personally don't like the idea of giving a normal girl a magic violin. It seems that playing it is just a trivial thing. And it's so unfair that she participates in the conpetion where everyone worked so hard to improve their playing. One can say that thanks to Kahoko, normal students started to get interested in classical music, but she did it really dishonestly. 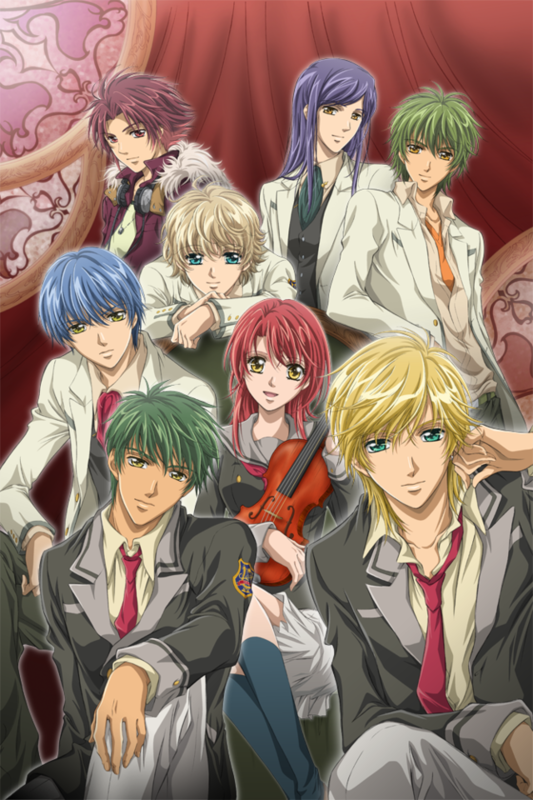 I must admit that thanks to this anime many people started to be interested in classical music. Other characters' stories are belivable. La corda d'oro can't be even compared to Nodame cantabile, that I really enjoyed. I trully regret watching this anime. For me it was a waste of time. you must watch this.. This anime is very good although ther's no much romance... This anime can make you knoww more about music.. And you'll fall in love with the sound of violin,piano,cello and many other.. I am a big fan of musicals in general, so when this anime came along I was so excited! I love all the music, storyline, and great characters used here. After watching all the episodes, I really want to learn to play all the instruments used here. Though that would be kind of hard^^. one night me and my friend were sitting at the computer and we were looking for a new anime show to watch... we saw a bunch of strange names and made fun of them... this being one of the shows... we took a look at all the shows we had made fun of, but it seemed we didn't like any of them. we came to the end of our list... this was it. we clicked episode one and just like that we were hooked!!! we watched episode after episode and soon we were in-love with it! the story was ok, i mean, like, we've heard it all before... isn't there something new out there? a new story? something different is what I'd like to see, but the way this story was written was still good. I instantly fell in-love with the music, mainly because it brought back memories... my parents love classical music and i do too, just not the kind they like... ever hear of apocalyptica? now that's classical music! (cellos and violins hooked up to amplifiers) but this show made me realize how wonderful classical music could be... i mean i went to see a symphony with my family and my friend and we (my friend and I) had about the most tedious experience of our lives! but this show, it's brought us to see how radiant sounding just one simple score could sound! although the kids in the end did have cymbals and tambourines so i can't complain...! but thanks to this show, i want to play violin, i want to get back into learning piano, playing the recorder (yes, the recorder) and learn how to play guitar again! wow... it's completely changed me! the characters... who wouldn't fall in-love with any of those guys? Hihara has got to be my favorite... (my friend and I fight over him lol) he's so hyper and i just adore it! Shimizu is second, he's so sweet, he kinda reminds me of near from death note (his looks and the fact he's young) he's just too adorable! next would have to be Tsuchiura, he's sweet and yet he can be cruel... stuff like that can usually grab any body's heart! Tsukimori comes next... i dunno what it is, but guys like him drive girls mad around here... we obsess over guys like him, we seriously do! they're just such jerks and then they turn around and care about you, but still it's in a mean way and girls just swoon over that around here! Fuuyumi is so cute! omigawsh she's adorable and totally like a little sister to Hino... she's very meek... but there's a saying, "one day the meek will inherit the world, they are too scared to decline." well, something like that... anyways! Lili has got to be one of my favorite characters! he's too... i dunno, he's just a retarded little messed up guy (in a good way) that's what i like about him though! Amou is annoying, but that's why i like her character, because she's annoying, she reminds me of one of my friends... her nickname just happens to be ennoying... ha ha! Kanazawa... i dunno what to say about him, one minute he seems like a teacher and the next minute he's just as bad as the students... lol he's a strange one, but man can he sing?! Ouasaki is a sweet character, he's kind and really seems to be very helpful... he's just another one of those characters anyone could fall in-love with! hino and then she changes her mind and even save hino at the final selection! last but CERTAINLY not least (obviously, she's the main character after all!!!) Hino, she's quite interesting, and i think no matter who you are you're able to connect with her in some way or another... I think she was one of those people who you can always find a friend in... some one you could depend on or go to if you needed help, even if she sucked at whatever you needed help with, she'd still do it! So there you have it, my thoughts on this series... here's my one sentence to wrap up the series "An excellent show that included profiles of many characters that you would find in a normal school to help you relate to your own life and some great music that has and will inspire many to succeed in whatever they choose to do." This anime is a really good anime to watch. It has romance, action, and music in it which almost everyone likes. The music in it is awesome! A very good anime for music and romance lovers out there. It reminded me of a time long ago. i love the music and animation, and the complicated romance. i hope she ends up with yukino or shizimu. i ♥ when characters choose the least expected for their boyfriend or girlfriend. the only problem with the anime is she won't choose anybody and she's too dense to see the almost 5 guys have a crush on her. lol.